9/21/2005 - LANGLEY AIR FORCE BASE, Virginia (AFPN) -- The Airman who died September 19, 2005, in a motor vehicle accident in Egypt has been identified. First Lieutenant Sarah Small, a public affairs officer assigned to the Air and Space Expeditionary Force Center here, was in Egypt supporting Exercise Bright Star, a recurring joint/combined training exercise, when the accident occurred. The 25-year-old Herndon, Virginia, native arrived at Langley in November 2003 and had been on active duty since 2002. She was a 2002 graduate of Mary Baldwin College in Staunton, Virginia. Two noncommissioned officers in the same vehicle were injured. They were taken to a local hospital where they are listed in stable condition. Sarah K. Small, a former Herndon resident and 1998 graduate of Oakton High School, was killed Monday in Egypt in a car accident while on active duty in the U.S. Air Force. Small was a First Lieutenant in the Air Force, serving as a public affairs specialist officer. She was based at Langley Air Force Base in Hampton, Virginia, and had been recently assigned to work on an exercise called Bright Star in the Middle East. Her father said Small had been in the Air Force for three years and had a bright future in the military. She was a graduate of the Virginia Women’s Institute for Leadership at Mary Baldwin College, an all-female military training program, and in her short military career had received the Air Force Commendation medal. Her parents, William and Gloria Small, still reside in Herndon. "Sarah was truly a leader," William Small said Wednesday. "She was a leader among leaders." "She was full of ambition and full of passion for life," said her mother. The Smalls said their daughter was always interested in helping people, from her activities in high school through college and into adulthood. Sarah Small was president of the Oakton High School student association her senior year, and was Homecoming queen in 1997. She was a member of many clubs and participated in many activities for the benefit of others, including taking part in charity fund-raising events, delivering meals for AIDS patients and volunteering in elementary schools. After graduation, she was invited to give the commencement address to the Oakton senior class of 2000. In college, she majored in political science and minored in leadership studies and communication. She was twice elected president of the student senate and was vice president of the Mary Baldwin student government association. William Small said when hurricanes struck the U.S. coast in 2004, Sarah wanted to take leave from her duties and use her own time to volunteer to help victims. When she was told she needed to be certified by the Federal Emergency Management Agency before she could volunteer, she took it upon herself to take the training courses on her own time so that she would be ready when the next disaster struck. "She was very, very well-rounded," said her mother. In addition to enjoying cooking, socializing and SCUBA diving, Gloria Small said her daughter had recently developed an interest in cycling and had participated in a three-day bike ride to raise money for charity. Sarah Small was the middle of three children, with an older brother, Matt, and a younger brother, Sam. The Smalls said they are proud of all of their children. "Sarah was just a special cut," Gloria Small said. "She was way beyond her years," her father said. Small’s first assignment in the military was at Andersen Air Force Base in Guam. Despite the loss of all of her personal possessions, Small worked tirelessly to help people affected by the tsunami that struck southeast Asia, and received honors for her outreach. In addition to her Air Force responsibilities, Small was active in Big Brothers/Big Sisters and the Jaycees, among other pursuits. Gloria Small said she saw her daughter for lunch on August 3, 2005, and that she and her husband talked or e-mailed with their daughter daily, including three times on the weekend before she was killed and a last telephone call at midnight Herndon time on the day she was killed. William Small joked that his collect telephone bill was astronomical, because the family made sure their daughter could call the house anytime she could from anywhere in the world. Sarah Small was the fifth generation of Small family members to serve in the military. William Small served in the U.S. Army. "We were proud of Sarah whatever she did," he said. "Sarah never met anybody who was a stranger," her father said. "And I truly believe there is no one who was Sarah’s enemy." Sarah Small will be buried with full military honors at Arlington National Cemetery later this year. Several memorial services have been scheduled in her memory. William Small said a memorial service was held Sept. 21 in Egypt. Mary Baldwin College has scheduled a memorial service for October 7, 2005, and Langley Air Force Base planned to have a service in the next few days. Memorials may be made to Mary Baldwin College at www.mbc.edu, or by mail to the Office of Institutional Advancement, P.O. Box 1500, Staunton, Va. 24402. Memorials may also be made to the Air Force Aid Society, 241 18th Street S., Suite 202, Arlington, Virginia. 22202. 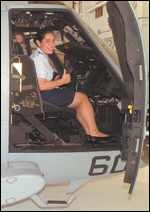 Air Force First Lieutenant Sarah Small, a Herndon native, was killed September 19, 2005, in a car accident in Egypt. It became clear to her family over the past week just how many lives Lieutenant Sarah Small affected. 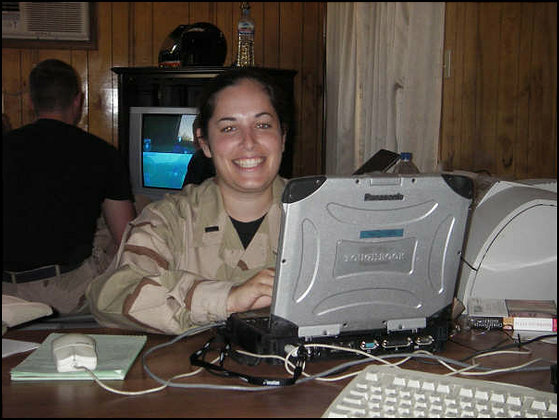 Since Small, 25, was killed in a car accident in Egypt September 19, 2005, her family has received dozens of calls and visits from people all over the world offering their condolences and sharing their memories of the Air Force public affairs officer. Her father, William Small, said that aside from Small's mother, Gloria, his daughter was "the most compassionate person you could meet." "Sarah will be remembered for her infectious laugh, her radiant smile and her twinkling blue eyes," he said. By all accounts, Small was a natural leader who was well respected by colleagues, made friends easily and won numerous accolades throughout her academic and professional careers. "This is an incredibly sad time for the AEF Center and for the Air Force," said Col. Brian Kelly, vice commander for the Air and Space Expeditionary Force Center at Langley Air Force Base, where Small was stationed. He described Small as "an energetic, exceptionally bright young officer." She loved her family, her country and the Air Force, William Small said, and she possessed a "very tender personality" and a good deal of courage. "Sarah would look danger in the face and snarl," he said. "She was deeply rooted in her Jewish faith and held her parents, brothers and religion very close to her heart," wrote Amanda Davis, a close friend and former roommate of Small's at Mary Baldwin College. "Those that knew her were naturally drawn to her warm personality," Davis added. Davis was one of about two dozen former Mary Baldwin students, professors and administrators who have posted their memories of Small on an online memorial at http://www.mbc.edu/news/small_memorial.asp . There are multiple memorial services planned for Small, who is survived by her parents, Gloria and William Small, of Herndon; brothers Matt and Sam Small; her dog, Jack; as well as extended family and friends. She will be buried at Arlington National Cemetery in December. Memorial contributions may be made in Small's name to Mary Baldwin College and the Air Force Aid Society. The college said it may set up a scholarship with the donations. Small's father, recalling one of many examples of her devotion to community service, said that when she was stationed at Andersen Air Force Base in Guam, the island was flooded by typhoons, destroying all of Small's personal possessions. Her response was to organize an effort among her Air Force colleagues to assist the local residents, even handing out water from her personal supply, William Small said. "She just didn't worry about herself," he said. Small was awarded the Air Force Commendation Medal for her leadership after the Guam typhoons, a rare occurrence for someone of her rank. The governor of Guam also gave her the ceremonial honor of membership in the Ancient Order of Chamorri and attended her farewell party when she was transferred to Langley Air Force Base in Hampton Roads. Similarly, after hurricanes hit Florida earlier this year, Small wanted to use her personal leave to go help out, her father said, but was told she could not because she needed certification from the Federal Emergency Management Agency. She quickly enrolled in FEMA classes and became certified, though she never had the opportunity to use those skills. Small announced in the fourth grade that she was going to have a career in the military, her father said. She was the fifth generation in her family to serve, though the first to be a career officer. William Small served in the Army. She was a 1998 graduate of Oakton High School, where she was elected student government president her senior year and homecoming queen her junior year. In high school, she was also president of several clubs, coached Special Olympics, delivered meals to people with AIDS and volunteered in local elementary schools, among other activities. In recognition of her high school achievements, Small was the first recipient of the White House Leadership Service Award. She was a 2002 graduate of the Virginia Women's Institute for Leadership at Mary Baldwin College, where she earned her bachelor's degree in political science, with minors in communication and leadership studies. She earned her Air Force commission through Detachment 880 at the Virginia Military Institute. Small was also active in student government in college, serving twice as president of the student senate and as vice president of the Student Government Association. She was also president of the President's Counsel. She was the publicity officer for the Mary Baldwin College Corps of Cadets. Small loved children, William Small said, and volunteered with Big Brothers/Big Sisters and the Jaycees, both in Guam and in Hampton Roads. When she knew someone who was being deployed, she would offer to care for their children for a weekend so spouses could spend some personal time together, her father said. Small enjoyed scuba diving and had recently taken up bicycling to participate in a three-day bike marathon to raise money for multiple sclerosis research, her father said. "I feel that everybody should give back to their community, whether it be local or nationally," William Small quoted his daughter as saying one time. "It’s been part of my life since I was very young. It is something that I do every day." STAUNTON, VIRGINIA - A memorial service in honor of Sarah Small, the first Mary Baldwin College alumna to be killed in active military service, will be held Friday afternoon, 7 October 2005. Small, 25, of Herndon, was a public affairs officer stationed out of Langley Air Force Base in Hampton, Virginia. She was killed September 19, 2005, in a car accident while participating in a military training exercise in Egypt. Small graduated from the Virginia Women’s Leadership Institute at Mary Baldwin in 2002. Her parents, William and Gloria Small, both were active members of the Mary Baldwin community. William Small still serves on the advisory board of visitors. A service will be held at 1 p.m. Friday at First Presbyterian Church in Staunton. There also will be a moment of silence to recognize Small during the leadership institute’s 3 p.m. parade. Small will be buried at Arlington National Cemetery at 9 a.m. December 2, 2005. Sarah Katherine Small was in the fourth grade when she told her father she was going into the military. Years later, Small was commissioned in the Air Force, becoming the fifth generation of her family to wear a military uniform. On September 19, 2005, First Lisutenant Small, 25, died near the Egyptian city Wady el-Natron while en route to a military training exercise. The van in which she was riding flipped over, ejecting Small, who died at the scene. Yesterday, hundreds of friends and family members gathered to commemorate Small's life as she was buried at Arlington National Cemetery. Mourners overflowed from the Old Post Chapel for a memorial service at which her parents, William and Gloria, her older brother, Matt, and her younger brother, Sam, shared their recollections. "She had an infectious laugh, a radiant smile and twinkling blue eyes," said William Small, who served in the Army. "Sarah was a leader among leaders. She was just able to rise to the top in everything she participated in, and she was always the first to volunteer and support others." After the service, mourners walked to the grave site, where Small was buried with military honors. Secretary of the Air Force Michael W. Wynne presented an American flag to her parents. Small was born March 13, 1980, in Nashville. Her family lived in Jackson, Mississippi, Pittsburg and Syracuse, New York, before settling in Herndon when she was in middle school. She graduated from Oakton High School, near Vienna, where she was student government president and was crowned homecoming queen her senior year. Two years after graduating in 1998, Small returned to Oakton as a commencement speaker for the Class of 2000. "She went out of her way for everybody, even if she barely knew them," said Jennifer Hurwitz of Reston, who met Small a decade ago through a B'nai B'rith youth group and attended high school with her. "If she ever saw somebody standing off by themselves, she would approach them," Hurwitz said. "If anybody was lonely or looked unhappy, she was always the first one to step up to draw them in. She was what a friend was meant to be." Small enrolled at the Virginia Women's Institute for Leadership at Mary Baldwin College in Staunton, Virginia, an all-female military program, where she majored in political science and minored in communication and leadership studies. She completed the Air Force ROTC program at Virginia Military Institute in Lexington, Virginia. Lisa Bliss of McLean met Small during matriculation, and together they experienced the travail of being first-year students at the Institute. "She was just a wonderful person and left a mark on everybody's life for the better," Bliss said, adding that Small inspired her to pursue her dream of studying for a master's degree in education. As she encouraged others, Small also remained focused on her own goals, Bliss said. "She had a desire to serve her country," Bliss said. "It just became a passion to her . . . something she wanted to do." After receiving her Air Force commission, Small was stationed at Andersen Air Force Base in Guam. In 2002, she lost all her belongings when a typhoon hit the island, but even during the crisis, she put others first. "She went out and found people less fortunate than herself and gave away her last ration of water because she knew she could find more," said her father, who added that she was awarded the Air Force Commendation Medal for helping the people of Guam after the typhoon. Small was later stationed at Langley Air Force Base, where she became deputy chief of public affairs at its Air and Space Expeditionary Force Center, writing articles for the public affairs office. She was sent to Egypt to support Exercise Bright Star, a training exercise involving tactical air, ground, naval and special operations forces of the United States and its allies. Her task was to keep those inside and outside the military informed about the operation. Small is the first graduate of the Virginia Women's Institute for Leadership to die in the line of duty.